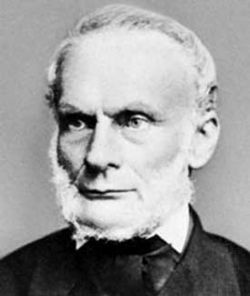 Rudolf Clausius, founding thermodynamicist and originator of the concept of entropy. Rudolf Julius Emanuel Clausius (January 2, 1822 – August 24, 1888), was a German physicist and mathematician who was among the first to clearly formulate the fundamental principles of thermodynamics. He also placed the kinetic theory of gases on a firmer footing than his predecessors and coined the word entropy to describe an important thermodynamic quantity. His later life was devoted to research in electricity and magnetism. Clausius was born in Köslin in the Province of Pomerania, the son of the Rev. C.E.G. Clausius, a clergyman and educator. He started his education at a school established by his father. After a few years, he went to the Gymnasium in Stettin. Clausius entered the University of Berlin in 1844, where he studied Mathematics and Physics with, among others, Heinrich Magnus, Johann Dirichlet, and Jakob Steiner. He also studied history with Leopold von Ranke. He graduated in 1844, and earned a doctorate from the University of Halle in 1847, with a dissertation on the optical effects of the Earth's atmosphere. Clausius's doctoral thesis on the refraction of light proposed that the blue sky observed during the day, and various shades of red at sunrise and sunset (among other phenomena), were due to the reflection and refraction of light. Later, Lord Rayleigh would show that the color of the sky was produced by the scattering of light. Nonetheless, Clausius used a far more mathematical approach than his predecessors. Clausius became professor of physics at the Royal Artillery and Engineering School in Berlin in 1850, and privatdozent at the University of Berlin. His most famous paper, On the Moving Force of Heat and the Laws of Heat Which May be Deduced Therefrom, was published in 1850, and dealt with the laws governing the relationship between heat and mechanical work. In this paper, he noted that there was an apparent contradiction between the concept of conservation of energy championed by James Joule, Hermann Helmholtz, and William Thomson, and Nicolas Léonard Sadi Carnot's principle outlined in a paper he published in 1824. Clausius restated the two laws of thermodynamics to overcome this contradiction. The first states that there is a fixed relationship between work done and heat generated thereby, or conversely, by heat absorbed and the work produced. The second is related to the observation that whenever heat is converted to work, it is always accompanied by a quantity of heat flowing from a hotter to a cooler body. This paper gained him the attention of the scientific community, and is often considered as having established the field of thermodynamics on a firm footing. Using these principles, Clausius deduced the Clausius-Clapeyron relation from thermodynamics. This relation, which is a way of characterizing the phase transition between two states of matter such as solid and liquid, had originally been developed in 1834, by Émile Clapeyron. In 1855, Clausius became professor at the Zürich Polytechnic, and in a paper written a year later, he clarified the conditions upon which he had earlier based the second law. Instead of relying on an argument denying the possibility of perpetual motion, he used a different axiom: Heat can never pass from a colder to a warmer body without some other change, connected therewith, occurring at the same time (Bricmont 2001, 29). In 1857, Clausius contributed to the field of kinetic theory of gases, which is based on the assumption that a gas consists of small particles in rapid motion. These particles are usually interpreted as being the same as the chemical molecules of the particular gas under consideration. Clausius refined August Krönig's very simple gas-kinetic model to include not only motion of translation, but also of rotation and vibration. In 1858, he introduced a fundamental concept of the kinetic theory called the mean free path of a particle—the average distance a molecule travels before it collides with another molecule. He also introduced statistical arguments and probability into his calculations, something that had not been done by his predecessors. Clausius took into account the likelihood that molecules in a gas would be moving at many different speeds at different moments. Earlier formulae, including Joule's expression for the velocity of a gas molecule in 1848, were based on a simplified model that considered only the average velocity of the molecules. Clausius's work was improved upon by James Clerk Maxwell, who not only vastly improved and applied the statistical arguments first introduced by Clausius, but also estimated the actual distance of the mean free path based on experiments on the rates of diffusion and viscosity for gases. Maxwell's calculation, made in 1860, was used by Josef Loschmidt in 1865, to derive the first estimate of the size of a molecule based on the kinetic theory. In 1862, Clausius criticized some aspects of Maxwell's derivation of the velocity distribution of molecules in a gas, leading Maxwell to revise his original calculations in works published in 1866 and 1867. In 1857, the same year Clausius was expounding his treatment of the kinetic theory of gases, he also hit upon a prophetic observation regarding the mechanism behind electrolysis. Clausius noted that electrolysis occurs at the slightest imposition of a voltage between the two poles of an electrolytic apparatus. It had already been proposed that, at the electrodes, dissociated ions release an electric charge. But Clausius proposed that ions exist, not only at the electrodes, but throughout the electrolyte. This startling conjecture, which at the time Clausius proposed it, was greeted with strong opposition, was not taken up until much later, and in a more forceful and successful form, by Svente Arrhenius in the late 1880s, for which he won the Nobel Prize. In 1864, Clausius published a version of his collected papers, and a year later, introduced the word entropy into the lexicon of physicists, it being a quantity purely mathematical in character, but which is generally found to increase in any process involving heat transfer and the accompanying production of motive power. Clausius chose the word "entropy" because the meaning, from Greek, en+tropein, is "content transformative" or "transformation content." Scientists, including Clausius, attempted to find a physical interpretation for this quantity, and it became a fundamental concept in all subsequent treatments of the subject. In 1867, Clausius accepted a professorship in Würzburg and two years later, one at the University of Bonn. "I think I have established my priority. At the end I wish to express my pleasure because an authority like Dr. Clausius contributes to the dissemination of the ideas contained in my papers on the mechanical theory of heat" (Bricmont 2001, 30). But the route Clausius used to arrive at his conclusions was somewhat different, and in Clausius's mind, superior, to that of Boltzmann. Clausius used a concept called disgregation as a starting point, and not entropy, as Boltzmann had done. He thus believed that he had achieved greater generality in his results. Maxwell, however, saw the efforts of both scientists as misdirected, as he believed that the fundamental treatment of the kinetic theory involved a statistical component that had little to do with classical mechanics. In his treatment of the molecular explanation of the second law, Clausius announced the virial theorem, which states that the average kinetic energy of a system of molecules over time is simply related to the average potential energy of the system. This theorem found applications beyond the kinetic theory of gases, and is often applied in astronomical research where a system of mutually gravitating bodies is considered (Kittel 1958, 223). Clausius's wife, Adelheid Rimpham, died in childbirth in 1875, leaving him to raise their six children. He continued to teach, but had less time for research thereafter. Much of the remaining decade he spent in investigating a new formulation of the laws of electricity and magnetism. In 1877, he explored a novel approach to the equations of electromagnetism, and derived a formula for the force acting between two charges moving relative to one another. Clausius was appointed rector of the University of Bonn in 1884. At his inaugural speech, he noted his dissatisfaction at the lack of a general paradigm relating thermodynamics to electricity and magnetism. Clausius died in Bonn, on August 24, 1888. Clausius was the first to clearly state the first and second laws of thermodynamics. He later pioneered the use of rudimentary statistics in an attempt to show how these laws can be explained by the kinetic theory of gases. His initial efforts in this direction were quickly overtaken by scientists who were perhaps better able to apply complex mathematics to the task. Maxwell and Boltzmann, later joined by J. Willard Gibbs, established the field of what would be called "statistical mechanics" on a firm footing. This did not stop Clausius from continuing to be involved in the debate among scientists as to the nature of the first and second laws, nor did it prevent him from making major contributions, such as the virial theorem. He was, however, overshadowed, perhaps to an unreasonable degree, by his illustrious competitors. This may be because he eventually distanced himself from the statistical view those scientists championed. Clausius attempted to demonstrate the second law of thermodynamics by employing William Rowan Hamilton's elegantly formulated principle of least action, and insisted on a dynamical, not statistical, interpretation—another reason why he may have received less attention in the history of the subject than he deserved. Still, that Clausius was the first to use the term "entropy," an essential concept in thermodynamics, cannot be denied. His work has immortalized him in the various equations and concepts that bear his name and stamp. He was elected a Fellow of the Royal Society of London in 1868, and received its Copley Medal in 1879. He received the Huygens Medal in 1870. He received the Poncelet Prize in 1883. He received an honorary doctorate from the University of Würzburg in 1882. The Clausius crater on the Moon was named in his honor. ↑ Ann. Phys. 79 (1850): 368–397, 500–524; translated into English in Phil. Mag. 2 (1851): 1–21, 102–119. ↑ Lucien Poincare, The New Physics and Its Evolution (London: K. Paul, Trench, Trübner, & Co., 1907), 160. Kittel, Charles. 1958. Elementary Statistical Physics. New York: Wiley. 222-224. All links retrieved May 25, 2013. Revival of Kinetic Theory by Clausius. Clausius biography in The MacTutor History of Mathematics archive. This page was last modified on 25 May 2013, at 14:38.